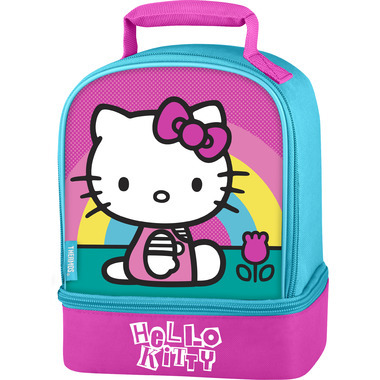 Pack lots for your little one with this dual compartment lunch kit. Please follow these simple tips to get the maximum performance and satisfaction from your THERMOS® brand product. Used according to their instructions, it will give you years of trouble-free enjoyment. For best results, wipe interior and exterior with damp sponge and mild soap after each use. DO NOT submerge entire box in water while cleaning. DO NOT use abrasive cleaners or cloths. Very nice, very good quality ad quite large. Perfect for a grade 2 school lunch! Fits a food jar in the bottom with room to spare! Love the bright color!